When I read about the ActiFry Fryer, a machine that uses new cooking technology to create crisp fries and other foods with virtually no oil, I immediately wanted one. Normally I’m not one to hop on the bandwagon and rush out and get a new gadget, especially when my apartment is bursting at the seams and if I put one more thing on my kitchen counter, I’m going to wind up cooking on the ceiling. So I sent a message to a friend who works with the company and she arranged to have an ActiFry machine sent to me, not expecting or in exchange for a review, but because I’m a wonderful person worthy of low-fat frites. I went out and bought a sack of potatoes, then came home, plugged in my ActiFry, and made a big batch of French fries with just a spoonful of oil. I followed the instructions, peeling then cutting the potatoes into bâtons, rinsing them, drying them thoroughly before putting them in the machine. Then the user adds one tablespoon of oil, closes the lid, and sets the timer for thirty minutes. Every few minutes, I peered into the machine, and nothing much seemed to be happening – at first. The potatoes were being stirred by the revolving arm, very, very slowly. And as the machine turned, skeptical me was surprised as the sticks of potato soon turned a golden-brown color. And after stopping the machine to pluck one out, a sprinkle of salt was all that was needed, and I had to admit the French fry was very good, somewhat mottled, but crisp! So next on the docket were Korean chicken wings, which were a success as well. The pros of this machine are that you can make crisp, fried foods with just one tablespoon of oil or fat, and that the machine does what it says it does: crisp-fried food with a minimum of oil or fat. Or mess: the machine comes apart easily so the non-motorized parts can go in the dishwasher. The cons are that the machine is not inexpensive (partially due to the fact that it’s made in France, rather than China, and there’s currently an unfavorable exchange rate) and although there are included recipes for curries and roasted meats, those tasks could be done using a standard stove or oven. And because of the cooking time and method, batter-fried foods like tempura likely won’t work in this machine. The ActiFry is also fairly large, about the size of a football helmet for a medium-size gorilla, and the parts, especially the metal non-stick pan, are thin and lacking in heft. *Disclosure: This machine was sent to me by the company with no expectations or promise of a mention. 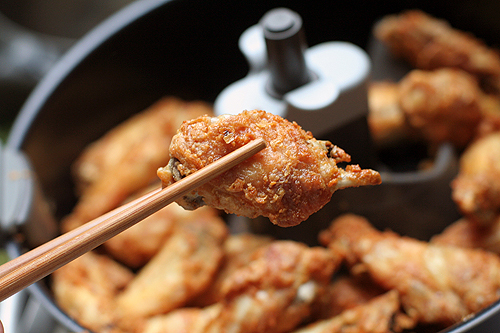 I tested five different dishes with the ActiFry: chicken wings, two batches of French fries, and fried rice (which ended up like crispy sizzling rice—happily), and I was pleased with the results. Alex: I invited 2 guests over (one French, and one who is American, who has a used cookware store in the states), who were as skeptical as I was about the fries, and they agreed that they were very good and tasty. The wings were another hit. I was surprised at how well they did. 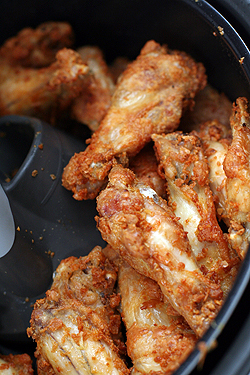 I didn’t compare them to deep-fried wings, but I’d say they are just as good. I did coat them in sauce afterward, which I plan to post about next. Tom: Before I got the machine, I visualized beignets, doughnuts, fried ice cream, and other batter-coated goodies. But since it takes about 30 minutes of stirring, which the machine does, those…and things like deep-fried Mars bars, would likely not work, as you’d just end up with a chocolate/caramel sludge. Which might not be too bad, but isn’t likely the result we’re looking for. Hannah: The machine was sent to me by a personal and professional friend who works for the company, and it wasn’t because of the blog. I don’t normally do product reviews, but thought this machine was innovative and interesting. Plus I used the ActiFry in the recipe in the subsequent post and wanted to give a little more background information about it. Wait…backup there for just a minute. A used cookware store? As in someplace to buy marmitons and casseroles and petit electromenager and things without having to promise my body or my first-born? WHERE? WHEN? HOW DO I GET THERE?! Interesting! We had the Seb company over at our career fair for my business school and they had brought the actifry (with fries) for us to try out–maybe they thought it would make us want to work for their company? Anyway, their fries were smushy and gross and I’ve had a negative opinion of the machine ever since. Your post makes me want to give it another try! I’m with Sunny. You can’t just drop a bomb like that and walk away. Dish! That chicken does look very, very convincing, though I too am wondering if it tastes like the real thing. Thanks David, for drawing our attention to this! This is intriguing. I’ve never heard of this machine before. Naturally one must not expect the taste to be exactly like deep fried food but that’s the point isn’t it? 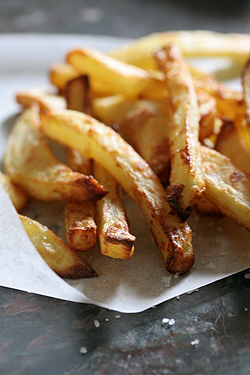 It’s so exciting that there’s a guilt-free-french-fry cooking machine out there. It is pricey though like you mentioned David. Denise — run a search for Un-Fried Chicken — it was printed in “In the Kitchen with Rosie” when Oprah first came out with her whole diet and fitness thing. The chicken is dipped into plain yogurt, then rolled in bread crumbs and spiced, then baked. It’s good…the yogurt gives it a buttermilk-y tang, and the bread crumbs soak up enough liquid to make it seem like a really good batter-dip. It’s not calorie-free, but it’s at least fewer calories than deep-frying. 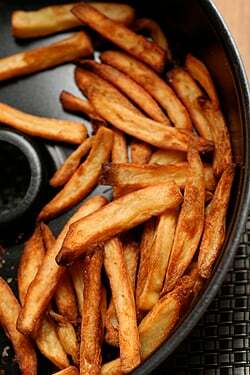 I bake my “French Fries” with a tablespoon of olive oil spread on parchment paper in a preheated 260° oven (treating the potatoes just like you do, rinsing and towel drying the raw bâtons). They are a good enough substitute for my family. I like them better than the fried ones. BUBBLE GUM FLAVORED BAGELS? WHERE???? How can I get some?!?!!? RECIPE PLEEEESE! Maybe if you flash froze the batter covered mars bar? Then you be able to deepfry and defrost it at the same time. The batter would melt but immediately crisp. Theoretically, therefore, over the thirty minutes, you’d have a crispy outside but soft n’ gooey interior? I don’t deep fry, so I have no idea what would happen. 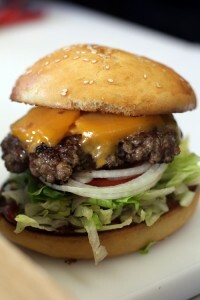 Fries like these seem to be on every menu in NYC lately……delicious. I posted your fantastic Israeli couscous w/ preserved lemons and butternut squash today on my site, it was wonderful! – Cut the batons to identical size like in DL’s photos or they won’t cook the same. If you don’t have the knife skills or the patience, get a mandoline. 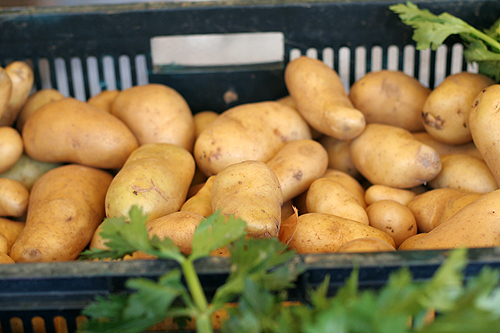 – The high starch potatoes are important for crispiness, in the US that means Russets. 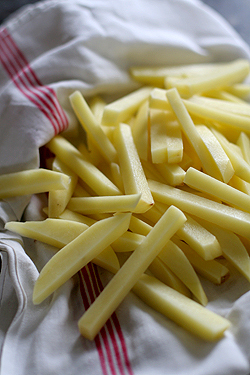 – Simmer the fries in a pot of water first until they are just tender enough to force a fork into. This allows them to be tender inside by the time the outside is done crisping up. 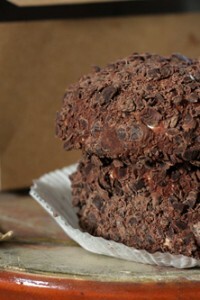 – Dry them completely before going into the oven or they won’t get crispy. – If you can use a convection oven (425F/215C) and put the fries on a cooling rack on top of a cookie sheet, not touching each other, then you won’t have to turn them like you do in the parchment-paper method. In my last batch, I didn’t toss the fries in oil like usual, but I did spray the rack with a little oil. Given that I now have a pretty good method for fries, this single-purpose machine doesn’t sound too practical, though it appeals to the gadget-freak in me. I’ll save the counter space for an sous-vide immersion cooker! Let me know when you find a good one of those! I read about it on Alec’s site and immediately wanted one. The force left me when I saw the prix. French fries and Chicken wings!! Any Girl or Guy looking for a boyfriend needs to get one of these machines!! JB+Merisi: I’ve made oven fries and they come out good, but not as crispy as these. I’ve seen a few British recipes that call for parboiling the potatoes then roughly tossing them in a wire colander, to coarsen up the surface, which allegedly makes crispier oven- or pan-fried potatoes, but I haven’t tried it. In the aforementioned book that Rosie wrote for Oprah, there’s an oven-fried French fry that calls for tossing the potato sticks in a bit of egg white. Et al: Yes, this machine doesn’t do everything. But it does fries and chicken well, and the sizzling rice was a real discovery, too. I’ve heard of folks doing risotto and polenta in this machine, since the slow moving arm is good for those not into standing over a pot and stirring. But the appeal of the machine to me, is the deep-fried like flavor and texture. That said, the price isn’t cheap. Unfortunately (and believe me, no one feels this more than me…) with the depressed dollar, many European-made goods reflect that. Hopefully that will improve, and perhaps as the technology becomes more widespread, the price of the machines may drop. Never heard of those types of potatoes. Are Monalisas from France? Sambas from Brazil? There should be one from the states called Bubba. I am always curious when it comes to food preparation tools, but I am not ready to give up a good portion of my precious kitchen space for one of those (also because when I do fry, 99% of the times it is tempura or sweet soft dough). On the deep fried mars bas: if anybody feels like trying to reproduce them with this fantastic tool, remember to add a battered cod fillet and a couple of onion slices to reproduce the real flavour. To all non UK – based skeptics: yes, they do fry mars bars (in my little town in Wales, just one chippy did it, they were not part of the tradition), and yes, they fry them together with onion rings and fish and whatever else they fry. They even dip them in the same batter. It is a supernatural experience. Oh my, how I miss the UK… (seriously. It made my home made food taste as good as Ferran Adria). I’ve been on a pomme frites and duck fat kick for a while now. Maybe the high price of this machine is a blessing in disguise; I already eat more spuds than I probably should. omg, i need to go out and get one NOW. especially since I just moved to Paris from NYC and have no desire to cook for myself except simple things. french fries are simple..and remind me on NYC (ok that might be a stretch). but somewhat healthy deep fried things? oui oui svp. Deep frying is my deal breaker. All that hot fat scares the bejesus out of me. I could be tempted with this machine. Noticed in the kitchen post you store utensils in a champagne bucket. What a great idea. Those Korean wings look fantastic and if I wasn’t about to be under a foot of snow (New England) I would run out to the market for chicken. The ActiFry looks interesting but is just a bit too expensive to give it counter space (or storage space) in my house. I am jealous of all interesting potatoes you seem to have … I’ve never heard of either of those kinds of potatoes … but you didn’t tell us which made the better fries … Monalisa or Samba. French cut beans … I was taught that French cut meant cutting the bean in half lengthwise, rather than cutting them at an angle. When you do it this way (a tedious job), they come out very light and soft and a pile of green beans is almost fluffy. Ron Popeil – he of Ronco Veg-o-Matic and Set-and-Forget-It fame invented a healthy deep fat fryer that never really took off. Maybe the French know something Mr. As Seen on TV doesn’t. I have to go, my hush puppies fried in bacon grease are ready…. Will you be sharing the sizzling rice recipe? That sounds really good too! My fella read about the ActiFry so we did some internet research and then decided not to buy it. Reviews said the paddle breaks easily, I don’t like the plastic lid (too hard to clean the oil off). It is very large and would be hard to store in this gnome size kitchen. The price of it is way more than we think it is worth, even if it uses less oil than most deep fryers. This might be an unpopular viewpoint so I apologize in advance, but if french fries aren’t all greasy, what’s the point? Olivia: It was basically cooked Asian rice, with chopped meat and vegetables, and kimchi, which I put in the ActiFry to see if it would heat it up without the boatloads of oil it usually takes to fry rice. It heated it nicely, and gave it a extraordinary crispy-crunch, just like the sizzling rice one finds in a Chinese restaurant. georgie: I haven’t had mine that long, but the plastic paddle seems pretty sturdy and the lid, while not as sturdy as I’d like, is very easy to remove and does go in the dishwasher. It is rather large and since my kitchen is pretty small, mine is residing in my bedroom…next to my ice cream maker! Karen: We do get interesting, and wonderful, potatoes in France. 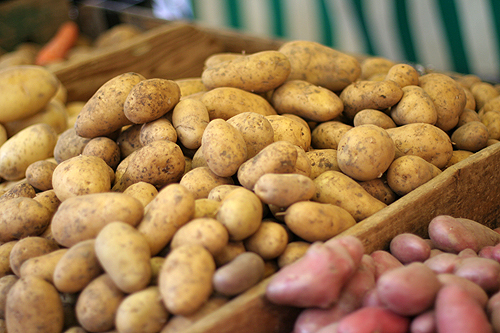 But at the farmer’s markets in America, I’ve seen tons of amazing-looking (and tasting) potatoes as well. They usually cost a bit more than supermarket varieties, but are generally affordable and worth the extra cost. Alec Lobrano told me that pomme de ratte potatoes (similar to fingerling potatoes in the states) are excellent, simply quartered, when fried in the ActiFry. How many people can one batch of rice feed ? Do you think it could fry spring rolls ? your site is an ”eclectic meandering through your life and you have such a colorful knack for allowing us to see through your eyes with a ‘hmmmm-mm’ over just about everything! Your stretch our imaginations. Thank you for sharing your honest views…and the pictures of your kitchen give all of us hope that we can ‘throw together’ all kinds of stuff in tiny spaces!!! I am an Englishman living in the South of France. I first saw this machine soon after its debut at the “Lakeland” shop in Chichester, England. It has been the most used piece of equipment in a crowded kitchen ever since. What amazed me was that, considering the desperate state of our pound sterling, after paying £40 postage and packing I still I saved £40 by ordering from England compared to the ‘discounted’ price at Amazon France. This says a lot about the well-known rapacious margins of French retailers. Like Julie, I am wondering how it does with egg and spring rolls. This looks so tempting! Not that I eat tons of french fries, but you know I would if they would taste like real ones. I wished it cost about 100 dollars less. I may grow weak though. I could always put this one on the counter where I have the bread machine. 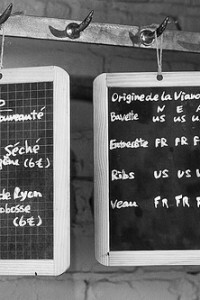 Why, David – your theme is facile: gastronomical thoughts with a French slant. And what a wonderful theme & blog indeed! I’m sorry David but when looking at your lovely frites, that fourth photo combination just makes me think of your la serpillière entry! It’s still funny reading it over and over again! Of course your beautiful towel looks nothing like a serpillière but it’s ingrained in my brain! Thanks for taking the time to explain the whole process! This is very helpful for veterans and beginners like myself! I’d been thinking about buying the Actifry for a while and your review really tipped the scale. 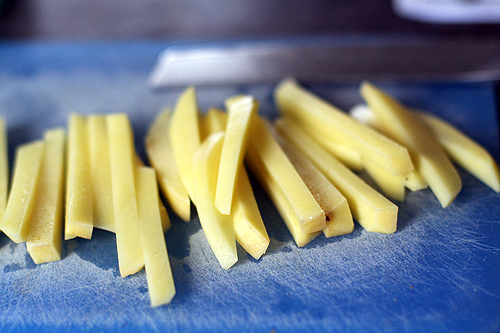 So far, we’ve only tried french fries – perfect during Lent – but am planning on trying other recipes as soon as Lent is over. Lakeland, UK have all failed and been replaced. Do not leave this machine in the kitchen unattended because it throws out black smoke in a matter of seconds when it fails. Look at the negative feedback on Amazon UK before you buy, and be careful. Hi Martin: Sorry you’ve had problems with yours. I’ve used mine about ten times and haven’t had any problems with it. I will keep an eye on mine. But so far, so good. I have never had better fries than are made in my Actifry. Bacon fat is the best (Farmer John Bacon), Chicken fat second best, and Beef fat third. Vegetable oil is uninspired but the fries are still better than any I have ever been served. I have yet to try Goose fat, and was not terribly impressed with Duck. 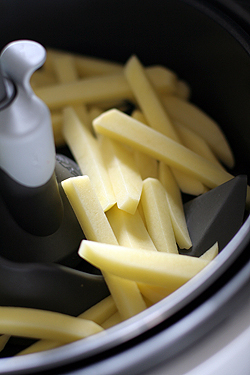 I love my actifry but that being said $300 is a lot of money to pay for French fries. I had little luck with tiny chicken thighs, and none with onion rings. Risotto worked great. All in all, the only negative thing I can say about it is the price. After all it is just a tube pan with a hair dryer attached and a motorized stirrer. Actually I throw 3 slices of bacon in first until they render their fat and then eat them and add the potatoes. Heaven! I’m curious about making pommes frites in the ActiFry as I’m a serious frites avec mayo addict. 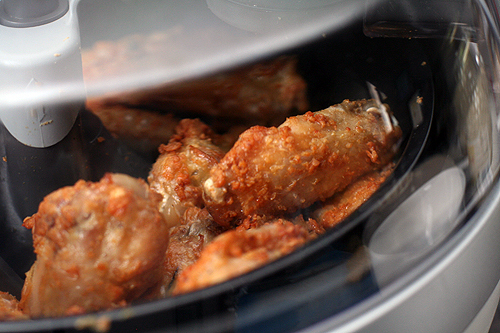 Can you simulate the “double-frying” in the ActiFry? You mean you want to re-cook them in the machine? Am not sure what the benefit of that would be since they already come out pretty crispy.